Three year old swimming class day 3 tonight. The first two days were really quite nice. I couldn't believe that the instructor got six kids that age to pay attention and do all ten tasks. My son did some things he's never done at home. Isn't peer pressure awesome! Next thing you know he'll be drinking beer or something. If you'd like to see a better recount of day 1, check out my other blog about the City of Miramar. I'm taking a camera tonight and will add some pictures over there later. 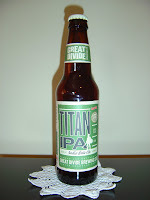 Tonight I'm drinking Titan IPA brewed by Great Divide Brewing Company in Denver, Colorado. Here is my original March, 2009 review. The label says this beer is "brewed for hop disciples". "ASSERTIVE" and "AROMATIC" also appear in a few places. There are three medals listed that this beer won, and they suggest pairing this beer with: grilled halibut, Thai curry, and strong/soft cow's milk cheeses. Bottled December 09, 2009. Hoppy, citrus fruity aroma with a little malt and spice in the background. Lots of pine flavors, a big tree's worth, to start. Light citrus is right next to the pine. There is a strong malty presence and a spicy peppery kick, too. Titan definitely leans bitter yet is still balanced. Not creamy or smooth; rather, the carbonation is pretty prickly. Very refreshing with a dry finish. Overall, a straightforward beer with great flavors. Nicely done! You should definitely try this beer and compare it against any of your other favorite IPA's. I wish I could be there too. I liked Titan tonight and remember loving Hercules, too, but it has been quite a while. This is a great IPA. I gave it an A+ when I reviewed it. 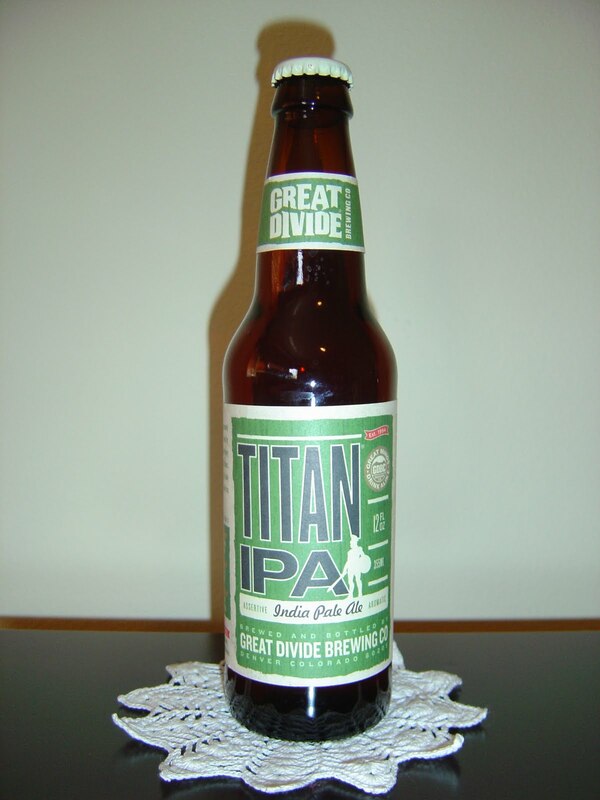 Great Divide have so many great brews. For sure, Mike. We've talked about Great Divide being underrated before, and no matter what the excuse or rationale is (we just don't get the distribution here, etc. ), I will stick by that statement. GD is a Great Brewery! Hi Hannah. I really like this beer. Hadn't had it in a while so it was time again. Let me go check out your review now.